1. Lend More Books: The BookLending.com system is programmed to reward the “most engaged” community members with faster book loans. And of course, the community wouldn’t exist at all without lenders, so please check your Amazon.com Manage Your Kindle page regularly to spot books you could lend out at BookLending.com. Have you been waiting a long time for a popular book? Why not purchase it and then “pay it forward” by lending the book to another BookLending.com member. Bonus Tip: Make sure you always click on the “Confirm” button at the top of the page after you actually lend a book at BookLending.com so that our system knows you completed the loan. 2. Request More Books: There are no limits on borrow requests, so treat your borrow requests like a Netflix queue and add any titles you would enjoy reading. If you have a wider toponlinelexapro.com range of requested books, you’re likely to get books more regularly. 3. Increase Your Maximum Books Per Week: Last week, we introduced a setting on your profile page that you can use to adjust the maximum book loans you receive per week. The default is one book per week, but if you want more books you can increase up to three per week. (You can also set the maximum to No Books to pause your books if you are too busy to read.) You may or may not receive your max number of loans in any given week, but you will not receive more than your max. 4. Explore the Read It Today Category: When you want to find something to read super fast, explore our Read It Today pages. These are the books that are in best supply at BookLending.com; our members report getting Read It Today books within hours or even minutes. You can find the Read It Today category by scrolling down to the bottom of the dropdown category list (at the top of the right-hand sidebar). Follow these tips to make the most of the book lending community at BookLending.com. Some Cool New BookLending.com Features! 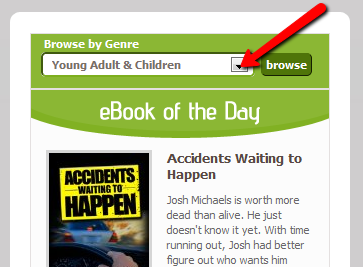 Browsing by Genre: You’ll notice that there’s a dropdown menu above the eBook of the Day in the right-hand column of inside pages. If you would like to suggest a genre we have missed, please email us at info@booklending.com. To see how neat it is to browse by genre, check out Bestselling, Romance, Non Fiction, Business & Investing or Young Adult & Children. No More Book Overwhelm: Go to your profile page to set the maximum number of book loans you would like to receive each week. Right now, the default is one loan per week. You can set it to No Books (this pauses loans) up to three books max per week. You may or may not receive your max number of loans in any given week, but you will not receive more than your max. Click here for a screen capture video that shows exactly how to change your maximum books on the profile page. Unlimited Borrow Requests: Say goodbye to our five-per-day limit. Request as many books as you like (think of your list of requested books as a Netflix queue for book loans). Read It Today Category: The Read It Today category features the books that are in greatest supply. If you’re fresh out of reading material and want to get a new book loan today, this is your category. Stay Posted With Twitter: Follow @blfeed to get real-time automatic updates about borrow requests and new books as they become available (our regular, chatty Twitter feed is @booklending). No More Blushing: Last, but not least, the erotica books have their own Erotica category [NSFW] now and they have been filtered off the non-erotica pages. Our software is doing this filtering automatically with about 95% accuracy – if you see anything that has been miscategorized, let us know at info@booklending.com and we’ll fix it. A number of BookLending.com borrowers are not getting their book loans because the email Amazon sends to initiate the loan goes into the spam folder. There’s an easy way to make sure this never happens to you: white-list Amazon’s email address so your email provider knows that these emails from Amazon are not spam. Even if you have received a loan email from Amazon already, your overzealous mail provider could still send the next email into the spam folder. From the BookLending.com FAQ, here are some guides for white-listing on popular email services. 1. Go to the “Options” page. 2. Under the “Junk E-mail” section, click on “Safe and blocked senders”. 3. Click on “Safe senders”. 4. In the “Sender or domain to mark as safe:” field, type “@amazon.com”, and click on the “Add to list” button. 5. Do the same for “info@booklending.com”. 3. Type “digital-noreply@amazon.com” in the “Email” field. 4. Click “Save” to add your contact. 2. Click on “Add Contact”. 4. Scroll to the bottom of the page and click on “Save”. 1. Click on the drop down arrow to the right of ‘Mail Options’, then click on ‘Address Book’. 3. Type “digital-noreply@amazon.com” in the “Screen Name” block. 1. Go to “Tools” and click on “Address Book”. 2. Go to “File” and click on “New Entry”. 3. Select “New Contact” and click on “OK”. 4. Type “digital-noreply@amazon.com” in the “Email” field. 6. Do the same for “info@booklending.com”. 1. Go to your Verizon Inbox. 3. Select the Block Senders tab (near the top of the screen). 1. In your mail configuration options, selecting “Hold for Review” option. Checking “Add to Contacts” and clicking “Save”. If Spam Blocker is enabled and if the e-mail message is legitimate and was screened as spam, take action by forwarding the original message as an attachment in a clean e-mail to: this-is-not-spam@worldnet.att.net.